It’s over, the long standoff. Simon and Schuster, Barnes and Noble, they’ve shaken hands and gone back to work, one publishing books and the other selling them. It’s been a battle hard on a lot of us in the trenches, those of us whose livelihoods depend on the visibility a chain like Barnes and Noble can provide our work. In the time when B&N would allow no S&S author to do an event or signing in their stores, when no store in the chain could order more than a couple of our new books, we worked hard in the other markets, knuckling down with the independent bookstores and with the smaller chains, and employing the internet in dozens of innovative ways. Through it all, we wondered: Can we still make it? For me, at least, the answer is yes. 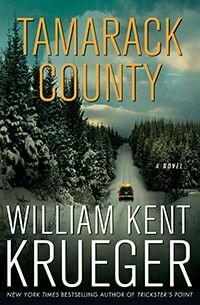 I just learned that Tamarack County, the thirteenth in the Cork O’Connor series, will debut tied at #15 on the New York Times bestseller list. This despite the fact that the resolution of the issues between my publisher and Barnes and Noble came too late to be of any use. The lesson for me? There are two, really. First, and most important, the bookselling world is still a large and vibrant one, and no single entity dominates. All the wonderful indies and all the other smaller players still make a profound difference. And second, this whole crazy situation has just reinforced my awareness that if you let yourself worry too much about of the incomprehensible business of the publishing world, you’ll just go nuts. To those of you who bought Tamarack County and helped it hit the NYT list, I offer you an Ojibwe thank you: Migwech. Tamarack County, the next in my Cork O’Connor series, goes on sale this Tuesday. My last four novels have been New York Times bestsellers. Tamarack County may not join the others on this list. That’s not because it isn’t good—it received starred reviews from Publishers Weekly and Booklist—but rather because it won’t be on that front table in every Barnes and Noble in the country. Nor can I appear in any Barnes and Noble stores to help with the promotion. This is because Simon and Schuster, my publisher, and Barnes and Noble are still at odds with one another over economic issues, e.g. the cost of in-store placement. They’ve been going at it for months and months now. When I tour with a new book, ninety-five percent of the stores I visit are independent booksellers. I love supporting the indies because they’ve always been very supportive of me. But the reality is that very few books reach the stratosphere in sales without a significant push from the big chain store. I can’t do anything about this situation, but you know what I’m hoping? I’m hoping that fans of my work will help spread the word that a new Cork O’Connor is available. And I’m hoping that readers will descend on their local independent bookstores and purchase the novel there, and that Tamarack County will still find its way to the bestseller lists. I’m thinking wouldn’t it be a wonderful example to S&S and B&N that readers can find good books on their own. And maybe these two giants can finally shake hands and get back to business. Yeah, I’m a born optimist.